The winning Action Express drivers Filipe Albuqueque and Joao Barbosa celebrate in Victory Lane. 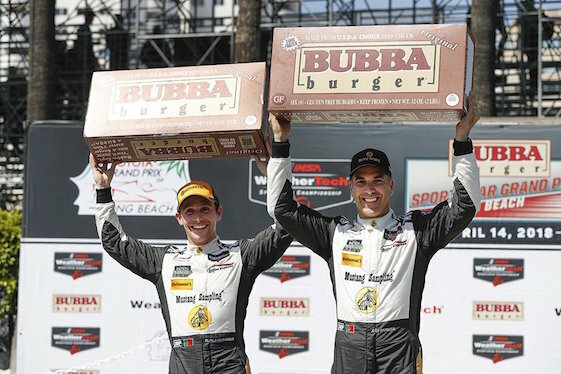 Joao Barbosa and Filipe Albuquerque ended a three-year winning streak for Wayne Taylor Racing’s No. 10 Cadillac DPi-V.R. team with an impressive performance that put the No. 5 Cadillac DPi-V.R. team into victory lane for the second time this season. In GT Le Mans: The No. 4 Corvette Racing team claimed its second consecutive victory class victory in the 100-minuteGrand Prix at Long Beach. Tommy Milner took the lead from Earl Bamber in the No. 912 Porsche 911 RSR shortly after a restart with under 23 minutes remaining as Bamber encountered a right-front suspension failure. From there, he cruised to a 2.157-second victory over Ryan Briscoe in the No. 67 Ford GT.